The political debate in Germany about the future of coal is finally moving forward, however, instead of naming a much-needed deadline for a coal exit, the likely new Government coalition has set a deadline to decide a deadline. Disappointing progress to say the lease, given it is leaving villages under threat of demolition for expanding coal mines, and continued uncertainty for communities and businesses trying to move forward to a better future. A German Kohleausstieg is key to reach the goal of a Europe-wide coal exit ultimately in 2030, so more pressure is needed on the new coalition to get rid of Germany’s coal addiction. That pressure may very well come from abroad. While Germany produces its own lignite (at the expense of complete German villages), hard coal is imported, and the ports of Rotterdam and Amsterdam are Germany’s main coal pusher. “Port of Rotterdam CEO Allard Castelein likes to advocate that his port embraces the Paris agreement and that companies who are not Paris-proof have no future. Now this is his litmus test. His words are only meaningful when he follows up on them and phases out coal.” – Willem Wiskerke, campaigner at Greenpeace Netherlands. Rotterdam and Amsterdam supply respectively 40 and 25 percent of the hard coal consumed in Northwestern Europe. Last year, Amsterdam announced that it would phase out the transshipment of coal in 2030. Amsterdam needs the space now occupied by mountains o f coal to fulfill the surging demand for housing. HES, the monopolist that owns all the coal terminals in the Netherlands, agreed knowing that coal demand is slowly declining and Rotterdam could still supply the German demand. 85 percent of the coal being offloaded from large coal vessels in Rotterdam is transported to Germany, via inland shipping and rail. The coal power plants along the river Rhine mainly depend on Rotterdam and Amsterdam for their coal supply. In the port of Rotterdam, HES-owned EMO is by far the largest coal terminal. It supplies 25 percent of the coal in Northwest Europe. Though the lease contract of EMO is ending in June, the harbor is planning to extend it with another 25 years, up to 2043. This controversy sparked a political debate in the city council of Rotterdam, which is a 70 percent shareholder of the port. In November, the city council adopted a motion that is calling upon the mayor and aldermen to make a plan together with the harbor authorities to phase out coal transshipment at a rate that is in line with the Paris Agreement. The motion was supported by a wide majority, including the Christian Democrats and the Social Democrats, the two political sides that can’t agree about a coal exit in Germany. But since then it has been quiet. Alderman Adriaan Visser who is dealing with the port is clearly not happy, nor is port-CEO Allard Castelein. 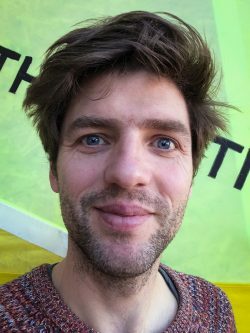 But Arno Bonte, council member for Groenlinks (the Greens) who submitted the motion, is insisting that Visser and Castelein follow up on the demand from the main owner of the port. Therefore, a coalition of German and European NGO’s have sent a letter to the city council and the mayor and aldermen of Rotterdam, to highlight not only that Rotterdam is in a crucial position to help hasten the end of the coal age in Germany and beyond, but that NGOs and the public will support their decision to phase out coal. Rotterdam, as a city being very vulnerable to rising sea-levels, should take this responsibility and pro-actively phase out the transshipment of coal, in line with the Paris agreement.